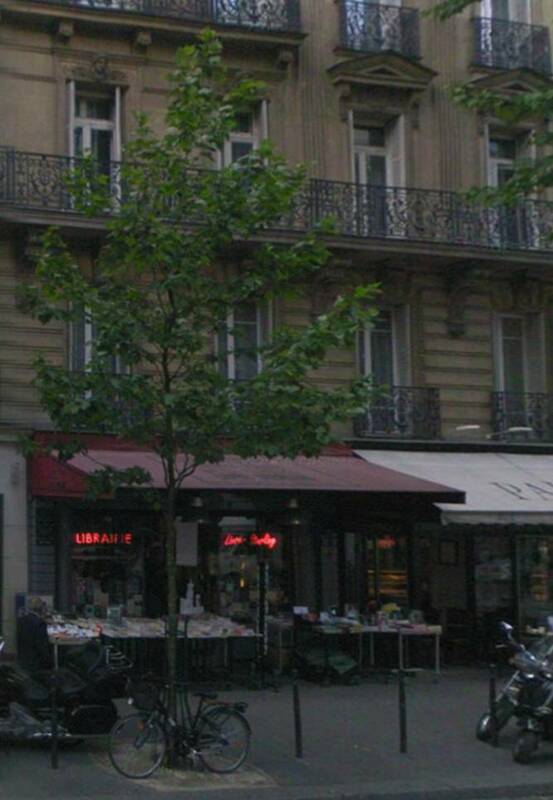 On the avenue Franklin Roosevelt, not far from the Champs-Elysées, is an unusual bookshop. The name, Livre Sterling, is a peculiarly anglophile pun on the fact that the word “livre” in French can mean either “pound” (₤) or “book” and “Sterling” denotes either money or quality. 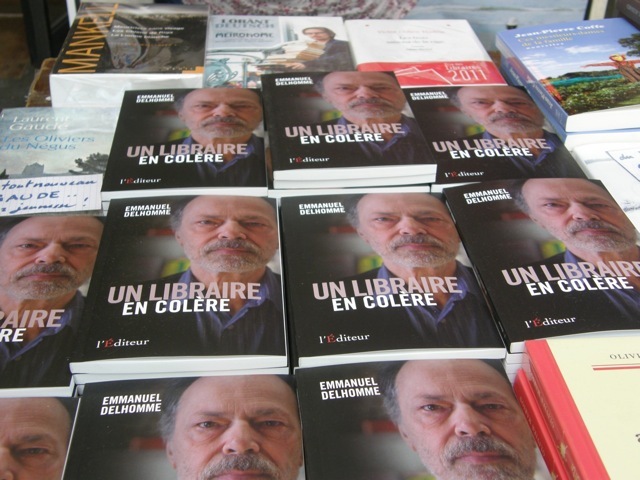 When we stopped by in spring 2011, the bookshop sported a handmade banner with the words “Un libraire en colère” (bookseller in a rage). Was this a protest against illiteracy and e-books? Only partly. It was a publicity campaign for the owner of Livre Sterling, Emmanuel Delhomme, who had written a book with that title, about the joys and perils of bookselling in a non-literate age. 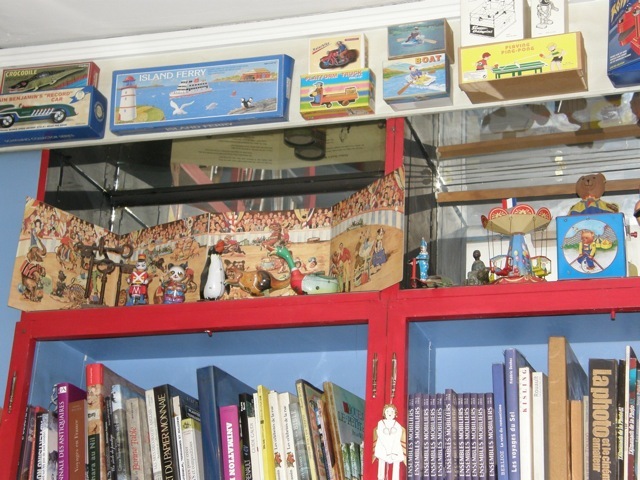 We made several visits to the bookshop, a delightful cavern filled not only with books, but with toys and odd objects on upper shelves and hanging from the ceiling. 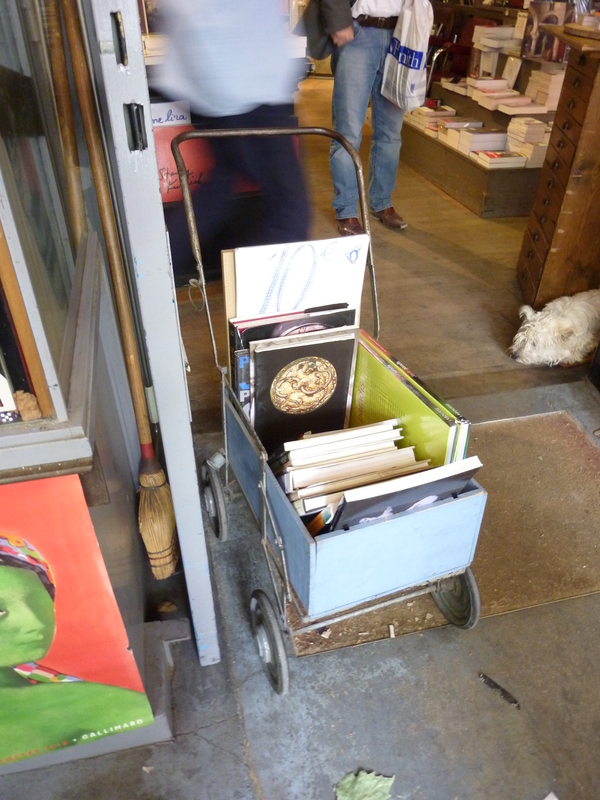 There was a resident dog, and inviting displays of books old and new on big tables. 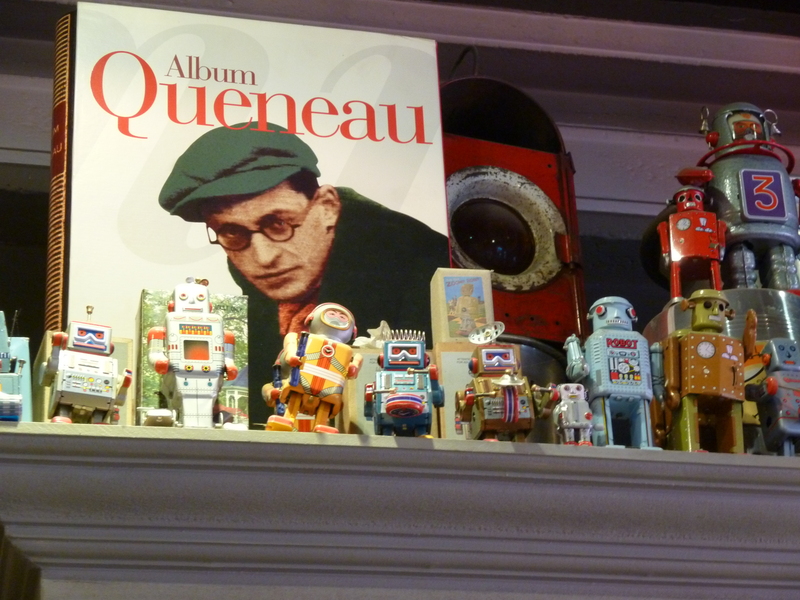 On a shelf, I spotted a photograph of Raymond Queneau. He is probably best known as the author of Zazie dans le Métro (1959), a novel that was made into a film by Louis Malle the following year. It’s the story of a little girl with very odd relatives who visits Paris and explores the city during a metro strike. The novel apparently caused quite a stir at the time because of its use of informal language. Well, thank heaven for Raymond Queneau. Because of him, I can read modern novels that dispense with hyperformal grammar (the passé simple and the dreaded conditionnel deuxième forme) and tell stories in the kind of language one learns in French conversation class. 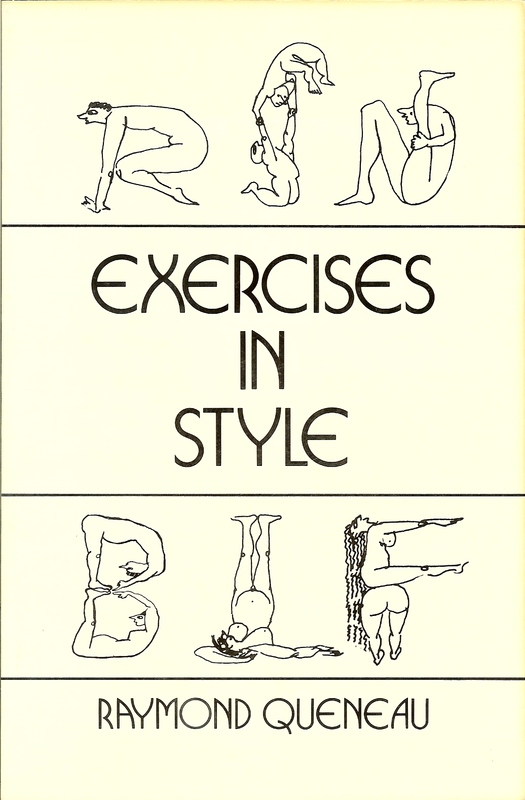 My own introduction to Queneau was actually through a translated version of his 1947 book, Exercises in Style. This is a series of short riffs on the same story (a minor incident on a Paris bus), told repeatedly using every conceivable variation on style: forwards, backwards, using metaphors or repetition, as a sonnet or Q&A, in the style of an official letter or a book blurb…99 variations in all. It’s a tour de force that should be studied by any aspiring writer. 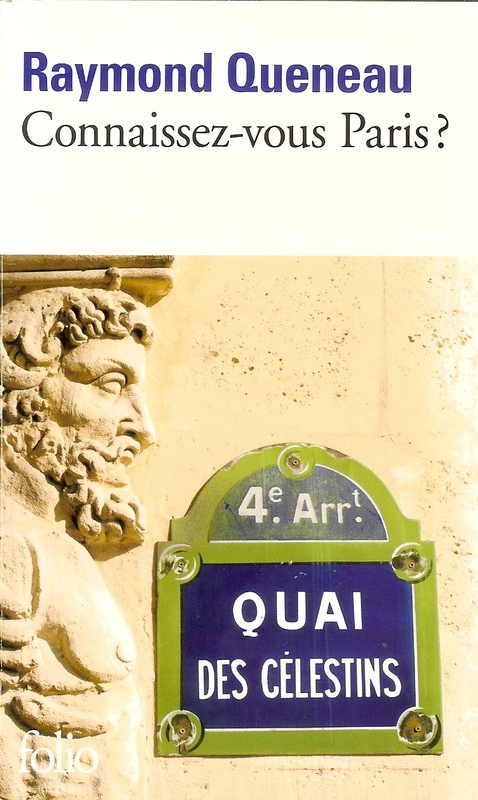 Foraging among the volumes at Livre Sterling, I found another book by Queneau, titled, Connaissez-vous Paris? (Do you know Paris?) 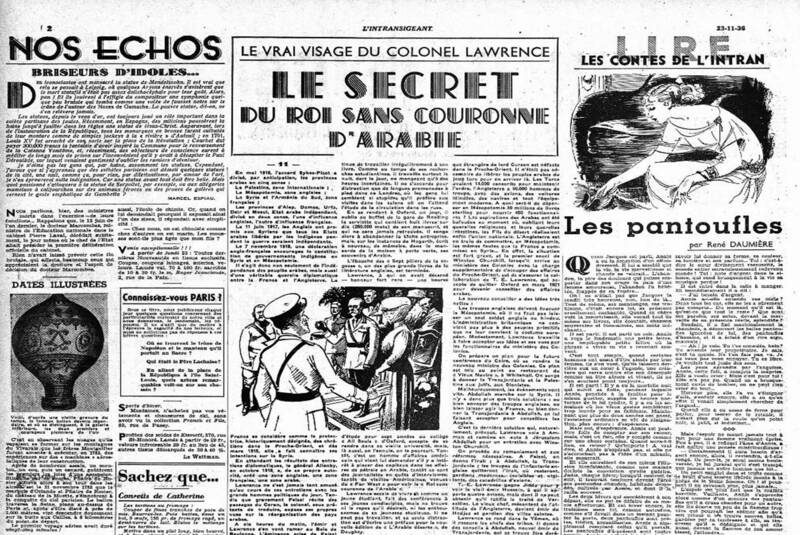 This 2011 Folio edition is a reprint of a 1955 book that contains a series of questions and answers about Paris lore and trivia, originally published in the pages of the newspaper L’Intransigeant, at the rate of three a day, between November 1936 and October 1938. The book contains about a quarter of the original 2,012 questions and answers. After all, a lot has changed since the 1930s. I thought I knew Paris pretty well, but in working on the questions, I realized that not only did I not know Paris, but that hardly anyone could say they knew Paris all that well. I started with Rochegude [Le Marquis Félix de Rochegude, author of Promenades dans toutes les rues de Paris par arrondissement, 1910], replaced these days with Hillairet [Jacques Hillairet, author of Dictionnaire historique des rues de Paris, 1935], and even though they were separated by less than 30 years, Rochegude had noticed many things that had since disappeared, quite simply, without revolutions or bombing… “The form of a city changes faster, alas, than the heart of a mortal” [Baudelaire]. Queneau’s questions are usually about location (where did Debussy die?) or date (when was the Saint-Louis Hospital founded?) or the origins of street and district names (where does the name of the Quartier des Enfants Rouges come from?). * Should you ever have to play a game of Trivial Pursuit based on your knowledge of Paris, the book would come in handy. 2. What caused the flood of January 1910? 3. How does one get change for a 500-Euro note? 4. Where was the first Ferris wheel in Paris and what happened to it? 5. What are those stone or iron objects at the edges of archways into Paris courtyards? 6. What is the story behind Rodin’s famous bronze casting of the Burghers of Calais? So many questions, so many stories to tell. And because each blog takes us quite a while to research, we have decided to publish every second week from now on instead of every week. We wouldn’t want to sacrifice quality for quantity. So we’ll see you in two weeks, and the story we tell may be the answer to a question you didn’t know you had. *Claude Debussy died on March 26, 1918, at 24, square du Bois-de-Boulogne. The Saint-Louis Hospital was founded in 1607 by Henri IV for plague victims. The Quartier (and the Market) named for the Enfants Rouges (Red Children) comes from an orphanage in which the children wore red uniforms. This entry was posted in Paris bookstores, Paris travel and tagged avenue Franklin Roosevelt, Claude Debussy, Connaissez-vous Paris?, Emmanuel Delhomme, Exercises in Style, Félix de Rochegude, Henri IV, Jacques Hillairet, L’Intransigeant, Les Enfants Rouges, Livre Sterling, Père Lachaise, Raymond Queneau, Saint-Louis Hospital, Un libraire en colère, Zazie dans le Métro. Bookmark the permalink. 7 Responses to Connaissez-vous Paris? Looking forward to your new stories about Paris……all so informative……history the way I like it ! been wondering about this for many years. The next time there (and there will be a next time, darn it!) I’ll have to check out Livre Sterling. “My” bookstore is Shakespeare and Company. I had left four copies of “Citizens’ Hall” with them on one visit, and on my last one found two left on the shelf. Made my day. I remember a small bookstore on the island (can’t remember which street) where every book in the window was protected by a thin layer of dust. The owner (I presume), a woman well beyond my age, was sitting behind the counter reading a book, a big cat was sprawled out on the counter, a scene that left me feeling not as a customer, but an intruder. I loved it! Really, revolutionary Paris at its best. Very warm and rich story about the “angry bookseller”. I like the picture with the resident dog 🙂 Your blog entries are certainly appreciated. I check your site for new entries about every day. This is absolutely (!) my favorite Paris blog…..I don’t mind every 2 weeks….it’s worth the wait!! !